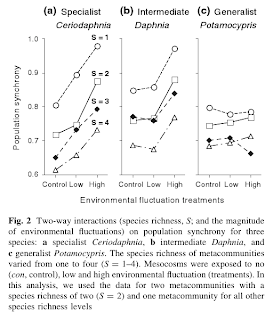 A new year, a new publication, this time with Shubha and Jurek: "Population synchrony decreases with richness and increases with environmental ﬂuctuations in an experimental metacommunity" in Oecologia. 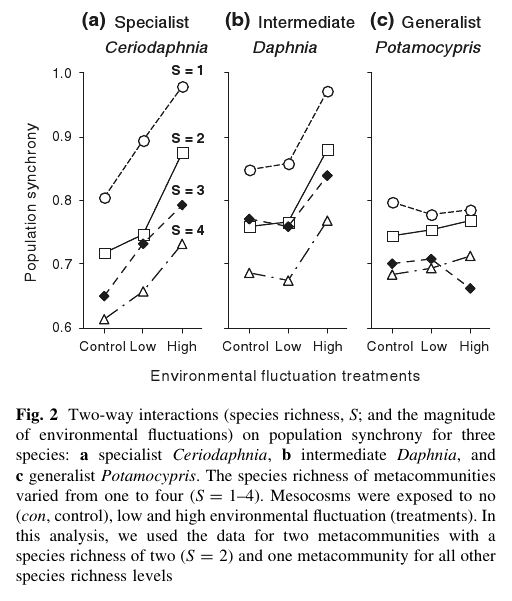 We continued our work with specialization in metacommunities, but this time looked at the implications on population synchrony. "We performed an unbalanced factorial analysis using the 15 effective numbers of dimensions, since replication of the two-species treatment in our experiment resulted in enough error degrees of freedom to test for an interaction effect between environmental fluctuation (EF) and species richness. We decided to use this unbalanced but replicated design because of time constraints. We were unable to implement a completely balanced design due to sample processing demands, which, for the sake of consistency, meant that all of the samples had to be counted within a short time frame." Because we were interested in synchrony in a metacommunity, we (i.e., Shubha) had to count densities of 3 species within all 4 communities of each metacommunity, or approximately 96 x 3 in total. All this in a limited time, and the individuals had to be put back to the original community to not affect population dynamics. This meant that we only had 2 replicated metacommunities (the experimental unit) for the 2 species treatment, and for all other treatments only 1 metacommunity. We thus had to be really careful in how we worded the Figure 2 caption (see above, last line), since we could in principle only compute a measure of spread (e.g., standard error or deviation) for the 2 species points. However, that was also based on only 2 replicates. We thus decided not to add these, because it would be even more confusing to have some points with and some without some measure of variation indicated in the figure. This could, of course, raise the question whether not adding this information to the main figure of our article is not only removing potential confusion, but also removes visual clues to readers about the limitations of our study, i.e., the lack of replication for most of the treatments. I do believe we are only guilty of the first (removing confusion), since to test the interaction term EF x S, we only had 3 degrees of freedom (see Table 1). Despite this low power, we fought hard to get these results in, because when looking at the Figure 2, I think nobody would question that the lines that connect EF treatments with the same species richness are basically parallel to each other, and thus provides visual confirmation of the non-significant interaction term associated with the low degrees of freedom due to lack of full-factorial design. This is thus one of my publications that for a large part hinge on the visual interpretation of the results (Figure 2, above) and the statistics (and all the other figures and tables) only had a confirmational role. I was really glad I had read Analysis of messy data, to convince the reviewers. Variation decomposition is a zombie idea?